THE VIDEO FOR CHRIS CHANDLER'S "Something in the Air/But It's Not on the Airwaves" opens with an Akron Beacon-Journal headline: "Ohio unit hit again; 14 dead." It's a reminder of the tumultuous time last August when the nomadic, Maryland-based "folken word" performer and Northeast Ohio filmmaker/webmaster Karen Kilroy created the video. Kilroy, who became friends with Chandler after hearing him play in New Orleans in 1999, was asked by him to create enhanced content for his 11th album, American Storyteller: Tales of a New American Revival. Kilroy's experience included creating two Web sites: one was the antiwar democracyrising.us, and the other was Dennis Kucinch's presidential campaign site. "In the course of helping Chris with the project, I had to hear the songs a lot," says Kilroy. "And I'm like, 'Something in the Air But It's Not on the Airwaves' needs a video. So I told Chris, 'I can help you.' And he was just like, 'Okay, how's Monday?' And he pretty much got in his car and came out and we did it. ""I wrote and directed the video and she shot and we edited it," says Chandler. "I've been wanting to speak in that voice in video for a long time." The track revolves around a recasting of Thunderclap Newman's 1969 hit "Something in the Air" into which Chandler interjects commentary about how the media has downplayed current antiwar sentiment and protests, comparing it to the '60s when tunes like "Blowin' in the Wind" and "Eve of Destruction" were released on major labels and played on mainstream radio. The video adds visual impact to Chandler's words with a mix of graphics, protest footage and scenes shot around Kent, Ohio, where Kilroy and Chandler set up shop, spreading word through the grapevine to find actors. An image of a young woman dancing to music on an iPod recurs; the young woman, played by local musician Sarah Rolan, also appears as a war widow, opening and closing the video in a cemetery. The day they were to shoot the scene, reality intruded upon storytelling. "Sarah showed up to shoot the scene on Tuesday," says Kilroy. "She was pale and shaken she had just found out that one of her best friends was killed on active duty the day before. But she still wanted to do it. Nate Deyarmin, Sarah's friend, just turned 22 the day before he was killed. He was a weekend reservist who signed up to learn how to fix cars; he had no idea he'd ever be sent to Iraq. We had decided not to use any soldiers' names, but then this kid dies, and Sarah asked us to dedicate it to him. It made it way more personal. "Kilroy says the video, which is posted at chrischandler.org, has had over 30,000 hits, thanks to articles, cable airplay and people passing the word. "We got overwhelming response from it," she says. "Most people who see it cry. I was surprised at the high number of men who wrote me and said, 'Darn you, I was at work and this thing made me start crying. '"Chandler, who has toured constantly for 16 years, will finally make it to Cleveland this week, playing Akron's Lime Spider and Cleveland's Barking Spider. Actually, it's not precisely his first time. "I played the streets of Cleveland in the late '80s and early '90s," he says. "I was just wandering around the country opening up my guitar case and playing on street corners. I was there a couple of weeks. But basically for the past ten years or so, I call up a place and ask to play and if they say yes, I go there. That never really never happened in Cleveland. 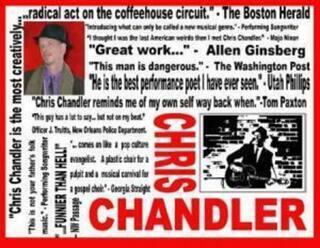 "Chandler's blending of amusing, perceptive verbal snapshots and commentary with music, created with the help of musician David Roe, lends itself to an offbeat show. "I love the stage, and I know enough to know that an evening of just straight spoken poetry becomes dull," he says. "I had to come up with ways to make an evening's entertainment. I pride myself on putting on a very different show. I run all over the place, and there's no telling what's going to happen. People ask me what I do for a living. I say I stand on chairs."